Dakjjim is braised chicken with vegetables. 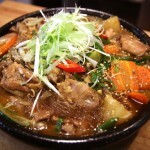 Dak (닭) is chicken and jjim (찜) is a cooking term for “braise” or “steam.” So dakjjim is also called jjimdak. 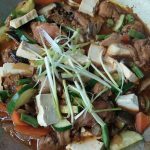 There are a few different versions of jjimdak in Korean cuisine, depending on the region it comes from and the ingredients used. 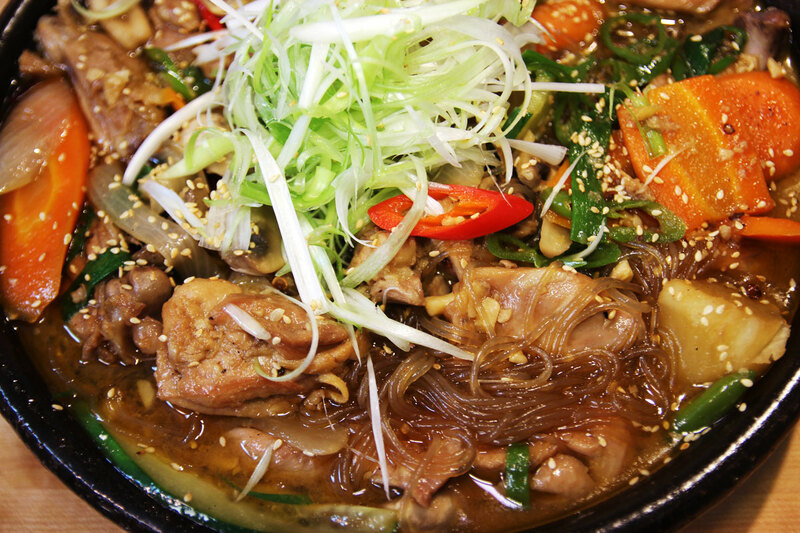 The popular Andong jjimdak is a special dish from the city of Andong. 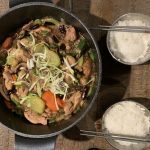 This dakjjim recipe that I’m introducing to you today is Andong style, which so many people have requested. 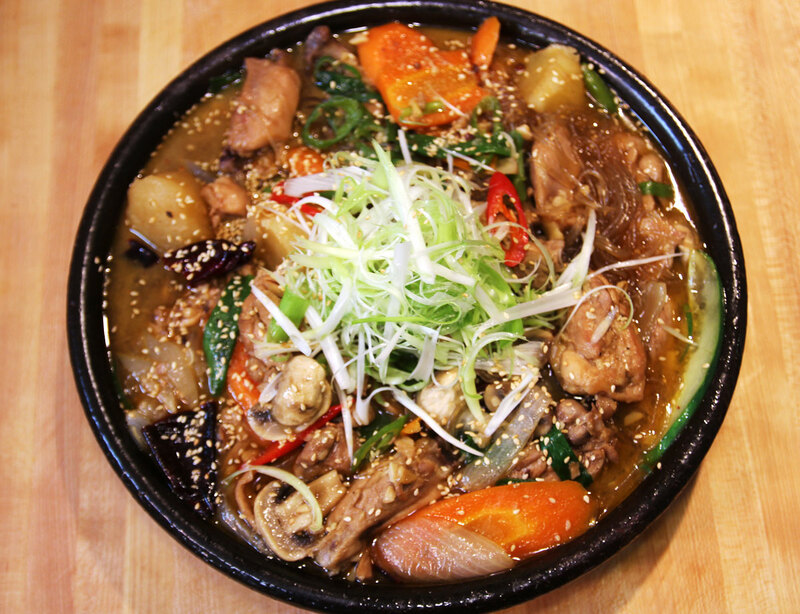 I’ll post a hot and spicy dakjjim (called dakbokkeumtang or dakdoritang) recipe someday in the future. 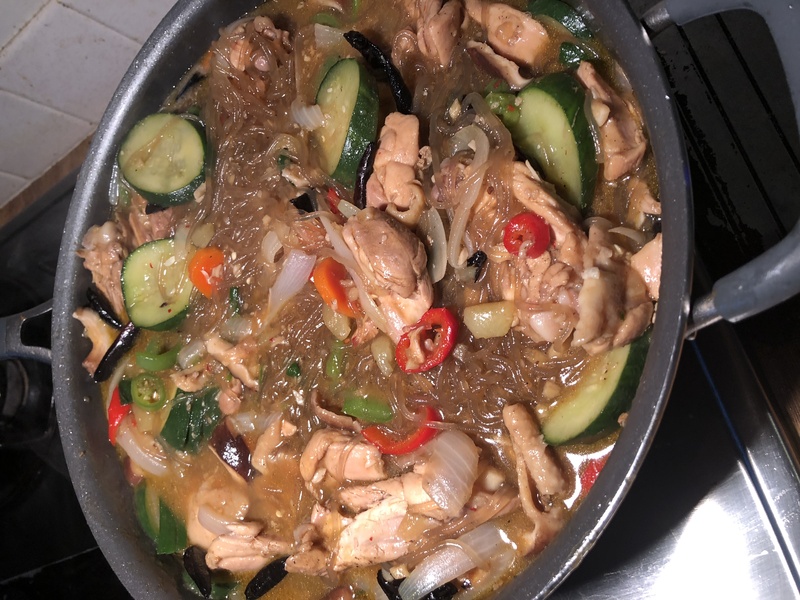 Chicken thighs, starch noodles, soy sauce, oyster sauce, rice syrup (or corn syrup), dark brown sugar, vegetable oil, dried red peppers, potatoes, garlic, cucumber, green onions, carrot, white mushrooms, onion, green chili peppers, red chili peppers, ground black pepper, sesame oil, and sesame seeds. Total preparation time: 50 mins to 1 hour. Trim the excess fat from 3 pounds of chicken thighs (or breasts or wings) and cut them into bite-sized pieces (1 inch x 2½ inches). 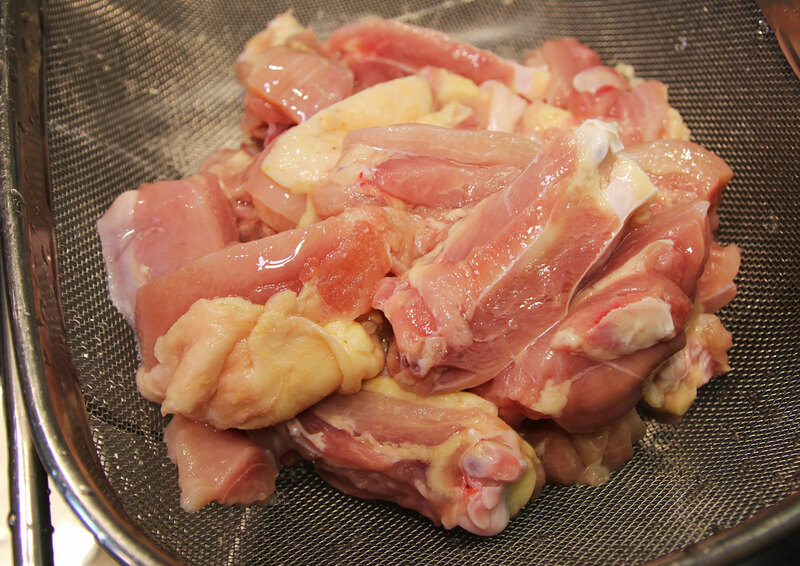 Rinse the chicken in cold water and soak it for a few minutes. Drain and set aside. Soak 100 grams (3.5 ounces) of starch noodles in cold water. 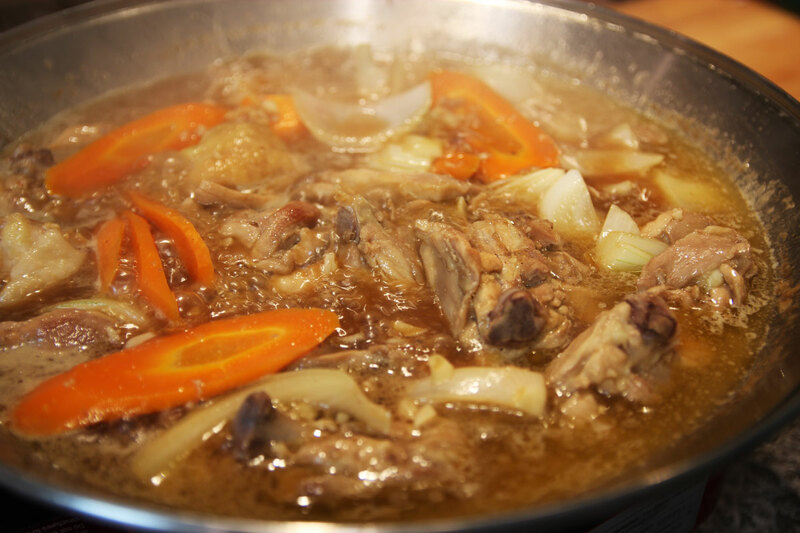 Combine ¼ cup soy sauce, ¼ cup oyster sauce, ¼ cup rice syrup (or corn syrup), and 1 tbs dark brown sugar in a bowl. Set aside. Cut 3 peeled medium sized potatoes into 1½ inch thick chunks. Slice 1 medium sized carrot into slices 1/8 inch thick. Slice 1 medium sized onion. Chop up 1 red chili pepper and 2 green chili peppers. Slice 1 cup’s worth of white mushrooms into bite-sized chunks. Cut 5-7 green onion stalks into pieces 2 inch long. Shred the white parts of the green onions thinly lengthwise, and soak in cold water for 10 minutes before draining. 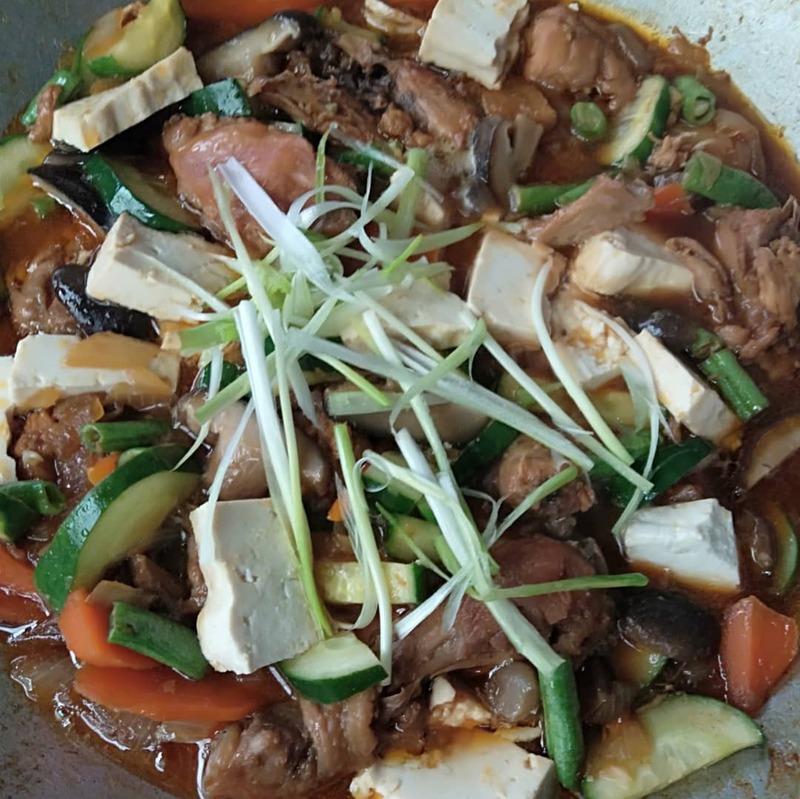 Heat up a wok or a shallow skillet. Add 1-2 tbs vegetable oil. 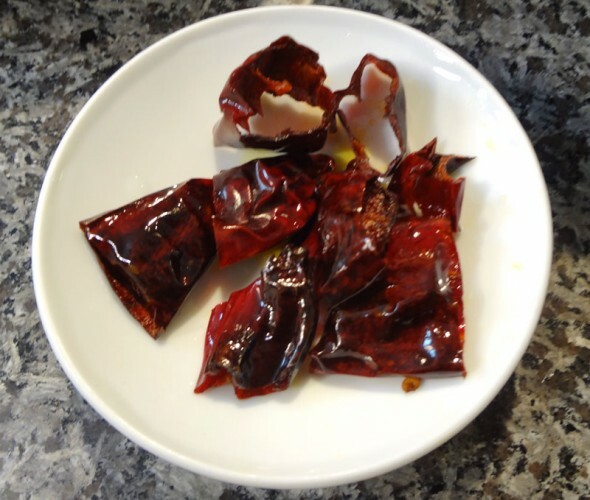 Cut 2-3 dried red peppers into pieces ½ inch long. 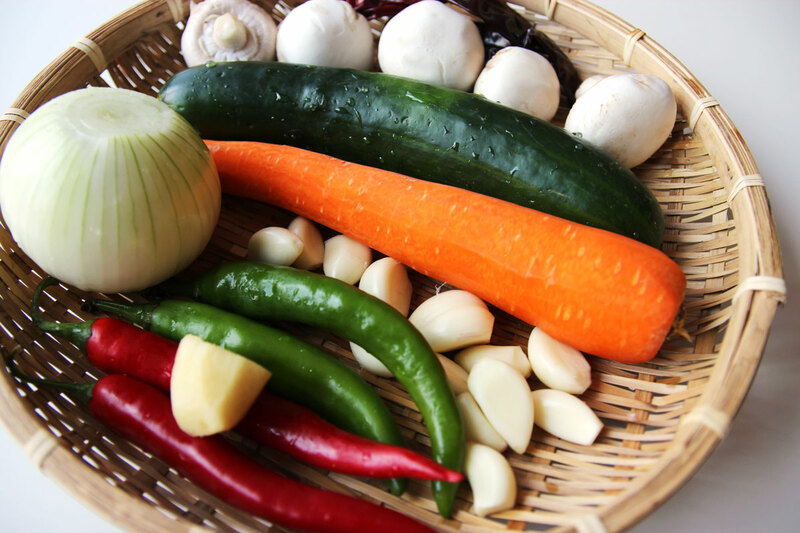 Add them to the heated oil and stir-fry for 10-15 seconds before taking them out. *tip: to prevent yourself from getting burned from flying oil, first place the chicken on the edge of the pot and then push it in with a wooden spoon. Stir the chicken with a wooden spoon a few times. Let it cook with the lid open for about 3-5 minutes. Turn the chicken over, give it a quick stir, and let it cook with the lid open for another 3-5 minutes. Add minced garlic and ginger and stir it for a minute. Add the potato chunks, the sauce, and 2½-3 cups of water. Cook for 10 minutes over high heat with the lid closed. Open the lid and add carrot and onion and continue cooking for another 10 minutes. Keep the lid open. Add soaked and drained starch noodles, sliced red pepper, green chili peppers, white mushrooms, and cucumber. Keep stirring for 7-10 minutes over high heat until the braising liquid has thickened and the noodles look translucent. 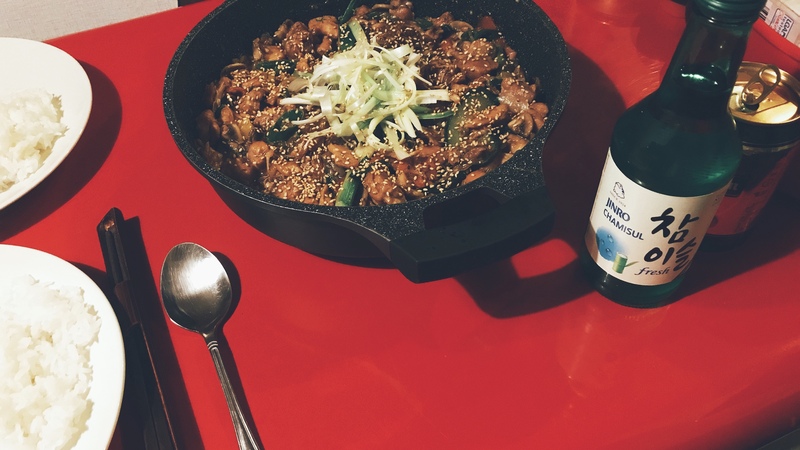 Transfer to a serving plate and garnish with chopped green onions and sprinkle some sesame seeds over top before serving. Posted on Tuesday, September 13th, 2011 at 8:53 am. Last updated on April 26, 2015. Posted March 29th, 2019 at 1:39 pm | Log in to reply. My husband and I don’t eat potatoes, what could we use to replace it and not affect the flavor of this dish? Thank you so much! Posted March 10th, 2019 at 10:00 pm | Log in to reply. Posted February 27th, 2019 at 11:24 pm | Log in to reply. Posted December 23rd, 2018 at 4:22 pm | Log in to reply. 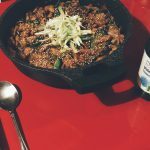 Is this recipe spicy? Would it not be good if I took out all peppers in the recipe for the kids? Posted December 28th, 2018 at 5:08 pm | Log in to reply. Yes, of course you can skip all peppers for your children. Good luck! Posted September 8th, 2018 at 9:30 am | Log in to reply. I always love your recipes and it always turned out delicious as well~!!! 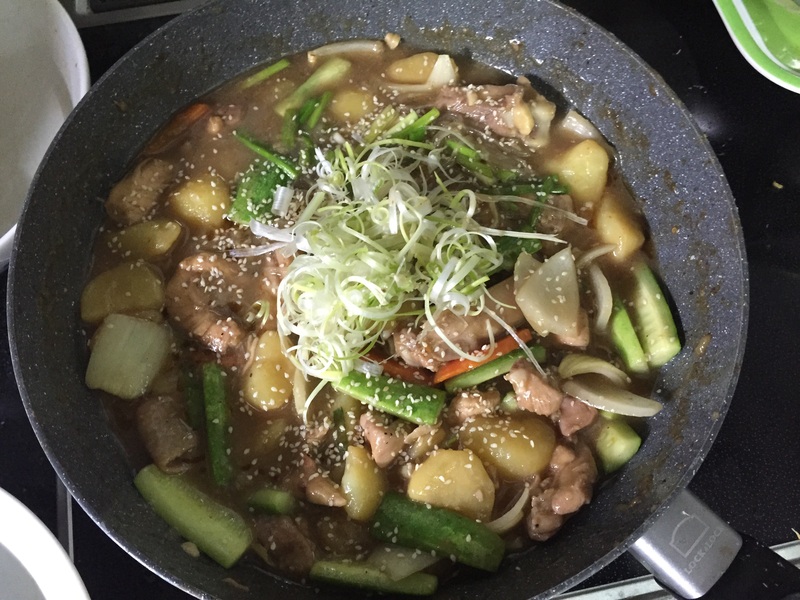 So my auntie suddenly want to eat spicy jjimdak so I made it through your recipe with some self modification, I add some chilli powder ( 고춧가루 ) and more chillies (청양고추) in it… turned out very nice!!!! Thank you for always sharing nice food recipes!!! Posted June 3rd, 2018 at 10:41 pm | Log in to reply. Came out so Delicious! Thank you !! I will be using this recipe for a lifetime. Posted March 11th, 2018 at 11:35 am | Log in to reply. 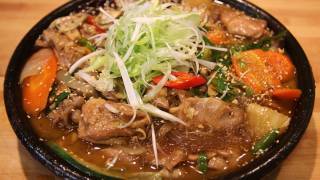 Really love this recipe Maangchi! Made it quite often already just like many of your recipes. I just wanted to point out that this recipe doesn’t state how much garlic and ginger is used. At some point we just have to add it, which can be confusing for some. I just looked at rhe picture and always use a lot of garlic and it always turns out delicious!! Posted October 18th, 2017 at 12:03 am | Log in to reply. i do not have any of the rice or corn syrup, can i replace it with honey instead? Posted October 19th, 2017 at 10:48 pm | Log in to reply. Honey sounds good! You can also use sugar. Posted October 20th, 2017 at 10:44 am | Log in to reply. I’ve tried using maple syrup and it turns up to be delicious too! my family love it so much but too bad that I’ve forgotten to take down a photo of it. Posted October 14th, 2017 at 10:21 am | Log in to reply. Hello, I like all your recipes. 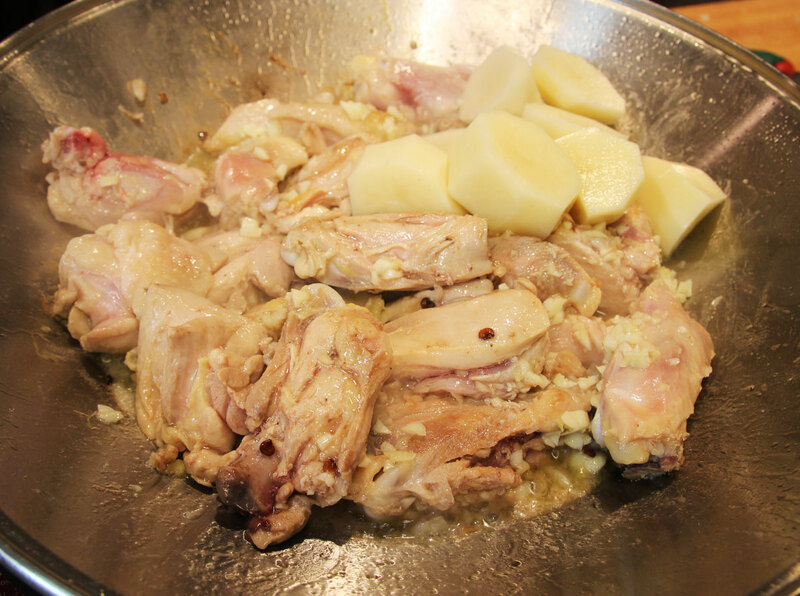 Today I triedn the 닭찜, we enjoyed with bread and white rice. I believe that next time will came soon. 감사합니다. Posted October 19th, 2017 at 10:43 pm | Log in to reply. Wow it looks like mine! The shredded green onions make it look so special! 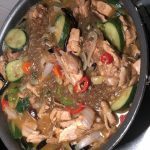 Good luck with your Korean cooking. Posted July 9th, 2017 at 1:42 am | Log in to reply. Such a lovely chicken flavor, so delicious! Made for my husband and he loves it. Already asking for it again and we have leftovers! Thanks for making these dishes accessible and bringing this flavor to my house. 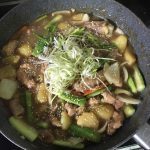 This recipe was originally posted on September 13, 2011 at 8:53 am by Maangchi. It was last updated on April 26, 2015. The video was watched 1,360,643 times on YouTube & has 14,606 likes!